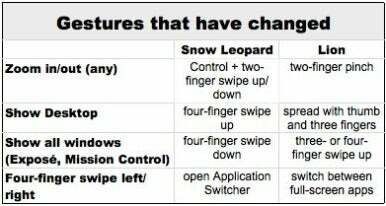 Lion’s support for gestures—tapping and swiping fingers on a Multi-Touch trackpad—isn’t entirely new. OS X has supported gestures in some form for several years. Even so, many of us still haven't adopted gestures as a way of interacting with our Macs. Maybe we don't have the right Multi-Touch hardware. Or maybe the mouse-plus-keyboard interface is burned so deeply into our muscle memory, we've seen no reason to switch. But if Lion is any measure, gestures are becoming an important part of OS X; someday, they might replace the mouse entirely. So Lion's launch is a perfect opportunity to make the switch—or, at minimum, to become conversant in this interactive language. And even if swiping and tapping on a trackpad is already familiar to you, you’ll still need to adjust to Lion’s new vocabulary. Here are some tips for doing both. Learning to use gestures in Lion will obviously be a lot easier if you've already been using them in Snow Leopard. To make things even easier, several of them haven’t changed. It can also help if you use an iPhone or iPad: Several of the gestures in Lion—including the single-finger tap, the pinch-to-zoom, and the two-finger rotate for images—are borrowed directly from iOS. If you've used any gestures before, you'll have an easier time learning Lion's new ones than someone who has never gestured at all. 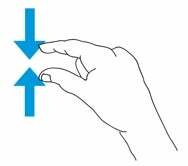 According to cognitive scientists, if you’ve trained your brain to associate an on-screen event with some kind of finger movement on a trackpad, it'll be relatively easy to remap that same event to a new gesture. The key to learning Lion's new gestures—as well as to learning gestures in general—is to be purposeful about it. You could pick up gestures eventually by using them haphazardly—but you'll learn a lot quicker if you do it deliberately. Here's one way to do so: Choose a gesture you want to learn and a day when you'll start learning it. Then, on your chosen day, stop whatever you’re doing every hour or so and spend a minute or two repeating the gesture. Repetition is important. So is a consistent context: If you practice for a while at the office and then a while at home, it won't be as effective as if you do it all at work. Repeat as necessary until you find you're able to use your new gesture unconsciously. One Lion interface tweak in particular has been giving some veteran users fits: Apple flipped the scrolling direction. In the past, if you swiped two fingers up in Safari, the scrollbar of the browser moved up; the webpage itself actually moved downward on the screen. Now, if you swipe those same two fingers upward in Safari, the page itself moves up. For many of us, the new scrolling direction felt at first like trying to write with the wrong hand. But we also found that it didn't take long to make the adjustment. In making the switch to the new orientation, it can help to think of visual metaphors: It used to be that moving two fingers up meant, “I want to view things higher on the page.” Now it’s, “I’m pushing this page up.” Interface designers recommend keeping such metaphors in mind as you learn; they can help your brain map gesture to effect more quickly. If you’ve never used a trackpad, Lion’s use of gestures might seem pointless. Why swap something that works—the trusty combination of mouse and keyboard—for something that’s simply new? To be honest, you don’t need to switch at all. Almost everything you can do with gestures in Lion can be done with keyboard and/or mouse. But as I said up top, Apple seems intent on making gestures an important part of the Mac interface. There are some who think that, eventually, the Mac OS and iOS will converge, making gestures more important still. You could stubbornly refuse to learn gestures or even to acknowledge their existence. But eventually that’s going to turn you into one of those people who’s still using OS 9. Assuming that you're willing to join the future, how do you go about learning gestures if you’ve never used them before? First, of course, make sure you have the requisite hardware—a MacBook with Multi-Touch trackpad or any Mac with a Magic Trackpad. The second step is to fix in your mind the benefits you’ll accrue from learning them. I’ve spelled out some of them above—they’re the future, you’ll be a fossil without them. But there are more practical reasons, too. Believe it or not, some of us have grown to like gestures—particularly when they do as much as they do in Lion. In some ways, they simplify the interface: You can do with one tool things that required two (mouse and keyboard) before. And if you commonly switch between a laptop and a desktop, you can use the same interface for both. In other words, a trackpad could actually make you more productive. My favorite rationale for adopting a new input device: New neurons are born in our brains every day. You keep only the neurons you use; the others die. Research indicates that learning new tasks may help keep new neurons alive. In other words, using a trackpad could make you smarter. Now that you're clear about why you're learning to use gestures, the next step is to divide them into two groups, each of which demands a slightly different learning strategy. The first group contain those that you might call “natural”: The effect of the gesture mimics the gesture itself. Put another way, such gestures embody clear and simple metaphors. The most obvious of these is the two-finger scroll (especially now that the scrolling direction has changed); as I said before, you can imagine that you’re pushing the page up higher on the screen when you slide your two fingers up the trackpad. The three- or four-finger sideways swipe to move from one virtual desktop to another is similar: You can imagine that you’re moving one desktop aside and pulling another one onto your screen. In each case, there’s a metaphorical connection between what your fingers do and what happens on the screen. The more you can keep those metaphors in mind, the easier it'll be for you to learn. 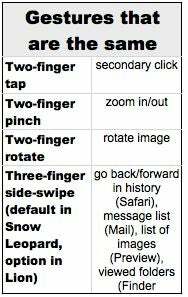 Spreading thumb and three fingers apart to expose your desktop (you're flinging aside open windows to see what's underneath). Some people might also include the pinch-with-thumb-and-three-fingers that summons Launchpad; personally, I haven’t been able to come up with a metaphor for that one. And some would include the three- or four-finger swipes up and down to see Mission Control and App Exposé, respectively. I haven't been able to come up with a good working metaphor for those either; maybe you can. You might have your own mental images of what each gesture does. It doesn't really matter what the metaphor is, as long as you have one. To learn these "natural" gestures, follow the routine described above—commit to learning, devote time to it, then practice repeatedly—and, as with the new scrolling direction, keep those metaphors in mind as you do. That leaves a bunch of gestures that don’t have any metaphorical match between action and effect. Fortunately, several of them correspond to things you’ve traditionally done with the mouse. For example, to click on an onscreen button with a mouse, you move the cursor over it and click with a mouse button; on the trackpad, you move the cursor over the button and click or tap with one finger. To summon contextual menus with a mouse you Control- or right-click; using the trackpad, clicking or tapping with two fingers (or clicking one of the trackpad's lower corners) does the same thing. To drag something on screen with a mouse, you click, hold, and drag; a three finger drag across the trackpad can do the same thing. In these cases, you’re remapping a single on-screen result from a mouse movement to a trackpad gesture. 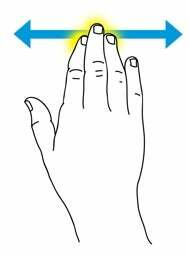 As with gestures you already knew, such remapping is easier than learning something entirely new. To learn these mouse-like gestures, again you just need to practice on purpose: Pick a gesture and deliberately repeat it. Finally, there are those Lion gestures that have no good metaphors and no mouse equivalents: Double-tapping with three fingers to do a dictionary look-up, double-tapping with two fingers to zoom, and (for some) those three- or four-finger up and down swipes to invoke Mission Control and App Exposé. To learn those, you'll have to rely on rote practice. They just might take a little longer to learn than the other gestures. But if you want to learn them, you can. One final thing that's important to remember: It might take some time to retrain your fingers, hands, and brain to use gestures, and you'll feel clumsy in the process. When you're feeling fumble-fingered, remind yourself that once upon a time you learned to use a mouse. There’s nothing natural about that at all. (Remember those stories of novice users trying to move the cursor by holding the mouse up to the screen?) Thanks to thousands, if not millions, of repetitions, those mouse moves are second nature to you now, while gestures feel utterly foreign. But if you learned to use a mouse, you can learn to use gestures, too. For a downloadable PDF illustrating and explaining Lion's Multi-Touch gestures, go here. Thanks to Reza Shadmehr, Wendy Wood, and Jamie Zigelbaum for their help with this story.